This is not one 4-bedroom cabin, but rather is 2 separate 2-bedroom cabins that are walking distance to each other and have a total of 4 bedrooms between them. We have created this 'combo' unit to facilitate booking these units together for one large group. It will only show as available when both of the cabins are open at the same time. 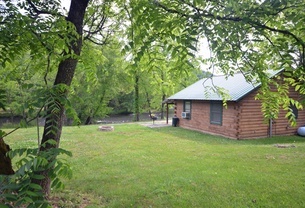 Halfway between Cherokee & Bryson City, enjoy the sounds of the rushing river all day long at Bryson City/Cherokee River Cabin. 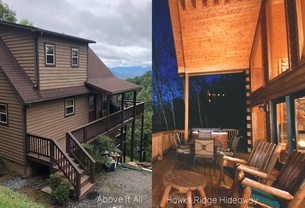 This 2 bedrooms and one bath value priced cabin has everything you need for a relaxing getaway, but is convenient to favorite things to do in the Smokies and Cherokee. Mountain Modern styling combined with smart-home technology make this latest edition to the Watershed collection a true top-shelf favorite. 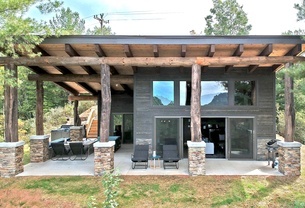 The massive covered porch brings the great outdoors in to the ample living space. 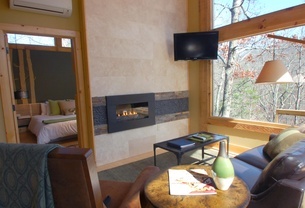 A ribbon flame fire pit on the patio and a chic led fireplace inside set the mountain ambiance, and the modern appliances and memory foam king mattress provide every convenience and comfort you expect from Watershed. 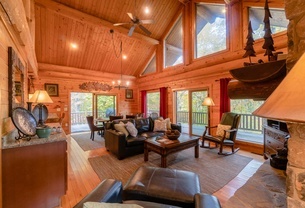 Wren's Nest is an exquisite hand-crafted log home with every modern amenity you can imagine. The interior is spacious and professionally decorated. Located within biking distance of a US Forest Service Trail that leads directly down to the Tsali trails, mountain bikers will love this place! 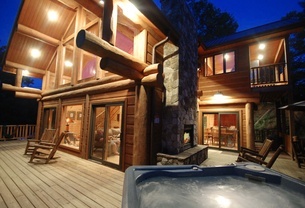 Watershed 11 is one of our most popular cabins with the outside fireplace, pool table, hot tub, and long-range view. It is just minutes down to hwy 74 and only 4 miles from the NOC or Tsali mountain biking. 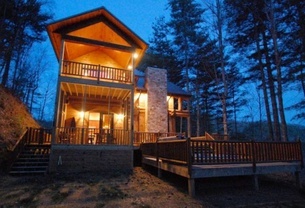 Also, this cabin is located on our 50-acre tract we call the Watershed Resort. What is the Watershed Resort? 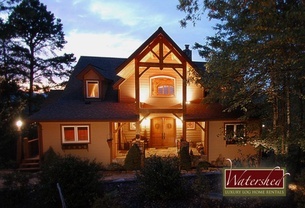 We have produced a video to answer that question and many more on the Watershed Resort website's about us page. This cabin is a popular honeymoon destination or a quick rafting/biking getaway (just minutes to Tsali or the NOC). A comfy king bed, a huge walk-in shower, and a large Jacuzzi tub are just a few reasons you may never want to leave this handcrafted log home. 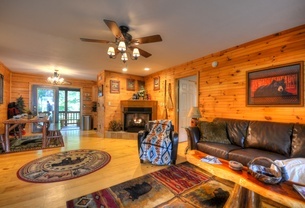 Bear Creek Den is a three bedroom, two bath, cabin situated on the beautiful Tallulah Creek. With incredibly easy access and plenty of room to park, even with a trailer, Bear Creek Den is the perfect basecamp for slaying the "Dragon" or just cruising around and enjoying the beautiful mountain scenery. Comprised of one level, and having only three steps up to access the cabin, Bear Creek Den is also a wonderful choice for those who have a little trouble getting around. 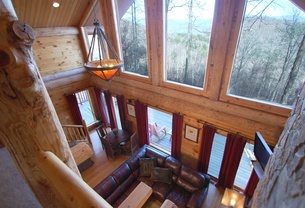 This ridgetop lodge is one of our largest cabins for number of people it sleeps. Packing people in is great fun, and there are plenty of bathrooms and beds, but be aware this isn't one of the more spacious designs, so it's cozy as you approach max capacity. It's locale is walking distance to other 2 bedroom cabins so even larger groups can be accommodated. At the Woodland Lofts, each unit stands separately with its own deck and hot tub. The setting is a small commune-like area on our Watershed Resort property. The 3 lofts share a common fire pit, grilling/dining area, and parking. Except for the deck layouts and some styling and color variations, these units are identical, so the photo galleries all show a collection of photos from all 3 units. LOFT 3 does have its own individual fire pit off the deck if you don't want to use the common area fire pit. The availability calendar shown for each unit is accurate for that specific unit. This unit has a 4 night minimum. The architectural accents and exquisite decor make this home worthy of publication, and Log & Timber Frame Magazine indeed featured this amazing home on its cover. Located in an upscale, gated community on a peninsula in Fontana Lake, you can't imagine a better surrounding of mountains, woods, and lake; yet you are still convenient to Bryson City and all the area attractions. The chef's kitchen, weight-room, soaring stone fireplace, whole-house sound system, and many other 5-star features make this one of our most luxurious homes. 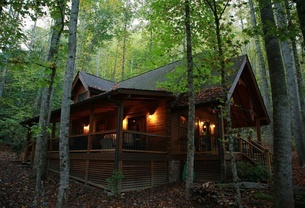 This mountain-chic loft style cabin sits nestled among the trees in a perfectly serene setting. 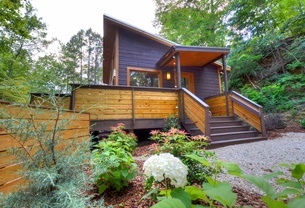 Recently renovated to accentuate the modern elegance of the loft like design and create abundant private outdoor space, this cabin is a perfect place for a couples getaway, writing retreat, solo escape or as a basecamp for outdoor adventures in the surrounding area. Sit outside on the partial wrap around deck, by the fire pit or soak in the hot tub under the stars and feel lost in the forest yet you are surprisingly convenient to all the area attractions. 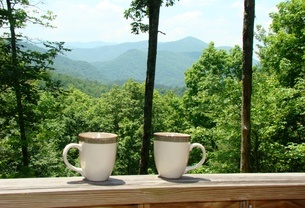 Just 10 minutes to the NOC or 15 minutes to Bryson City puts you in touch with the adventures and conveniences of the area, if you ever manage to leave the modern comforts of your base camp loft. This exquisite cabin has been recognized for the details. Featured in multiple magazines, Happy Trails has unmatched style and comfort with a location that puts you as easily on the Nantahala River in a raft as it does at a gaming table at Harrah's Cherokee Casino. You can also reach the Tail of the Dragon (US 129) in just over an hour. Perfect for 2 couples or a small family, you'll love this basecamp under the trees. Sit on the covered porch, explore the walking trail to Tracy Falls where you can enjoy a waterside picnic, or nestle by the beautiful indoor fireplace. Centrally located between Bryson City, Murphy, Franklin and Robbinsville, Bear Haven Chalet is just 2 minutes from the most pristine lakes in the Southeast, Lake Nantahala. It is also within walking distance of the Bartram Hiking Trail that connects to the Appalachian Trial and only a few miles to the historic Wayah Bald Observation Tower. 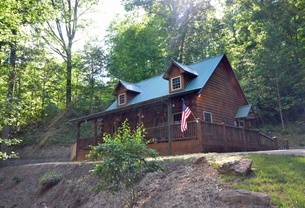 Laurel Ridge Cabin is a Gem in the Heart of the Smokys. 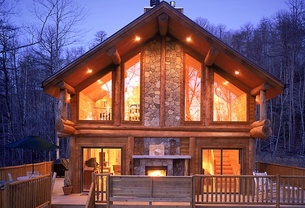 This two bedroom, two bath log cabin is just minutes from Cherokee, making it convenient to both sides of the Great Smoky Mountains. Pigeon Forge and Gatlinburg are just a scenic drive through the National Park, and Bryson City with the Great Smoky Mountains Railroad is less than fifteen minutes away.